An animal disease research centre in Surrey has been fined over the safety of its experiments on cattle infected with the foot-and-mouth virus. The Pirbright Institute was fined £72,350 by City of London magistrates after admitting it was at fault. The Health and Safety Executive (HSE), which prosecuted, said there was no external release of the disease. The breaches occurred when a ventilation system was operated in a different configuration from normal. Speaking after the hearing, Dr Simon Warne from the HSE said the failings were "significant". "In common with other sites that pose major or significant hazards, either to people or the environment, there needs to be protection in depth," he said. "This involves having a number of protective measures, with each one providing some degree of assurance in the event of other failures." The institute, in Ash Road, Pirbright, carries out research into farm animal disease and viruses that spread from animals to humans. 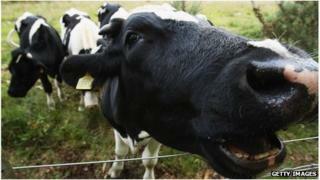 The breaches of the Specified Animals Pathogens Order took place in November 2012 and January 2013. A spokeswoman for the institute said it had accepted the charges and "no issue of human health was involved". "The incidents that led to the breaches showed that certain institute processes and actions had fallen short of the standards that the public, partners and the institute itself expects," she said.